Events on the Kyrgyz-Kazakh border show that Kyrgyzstan has had great expectations on the Eurasian Economic Union (EEU), President Almazbek Atambayev says accepting credentials from ambassadors of 12 countries on 27 October in Bishkek, the press service of the head of Kirghizia reports. «Despite everything, I am sure, now and in the future, our fraternal Russia was and will be our strategic partner and ally. But these events have shown that we should not be deceived and rely too much on EEU in economic development. Well, there cannot be a reliable union which depends on the whims of one person. Any union must, first of all, abide by the agreements and accords concluded between the participants of the union,» Atambayev states. Therefore, he instructed the government to find alternative markets for Kyrgyz produce. "No need for particular search. It is a 32-million market in Uzbekistan and a one-and-half-billion market in China," the president says, referring to the sale of perishable agricultural products. He recommends businesspeople to send industrial goods to Russia by sealed railway vans. Atambayev is convinced that Kyrgyzstan must urgently build a new railway. "Every dark cloud has a silver lining. The latest events at the border showed the need for an urgent project and the construction of the China-Kyrgyzstan-Uzbekistan railway; then this road will go through Turkmenistan and Iran with access to the Arabian Sea and the Indian Ocean," Kabar news agency quotes Atambayev. The President recommends establishing a joint venture with the participation of the Chinese, Kyrgyz and Uzbek parties. "I am saying openly that such an agreement with the president of Uzbekistan, my friend and brother Shavkat Miromonovich [patronymic name expressed as a sign of respect - note by Fergana News] Mirziyoyev, already exists," Atambayev said. The president also added that Kyrgyzstan needs to "develop an open skies policy," to develop aviation, "thanks to fraternal Russia, there are no problems with kerosene, it's cheap for us." Since 10 October, Kazakhstan transferred the border troops to a reinforced regime of service, and then set checkpoints with armed soldiers on the Kazakh-Kyrgyz border, explaining it by the presidential election in Kyrgyzstan, and in fact - complicated the citizens of Kyrgyzstan to cross the border. As a result, at all checkpoints, long queues from the Kyrgyz side emerged. 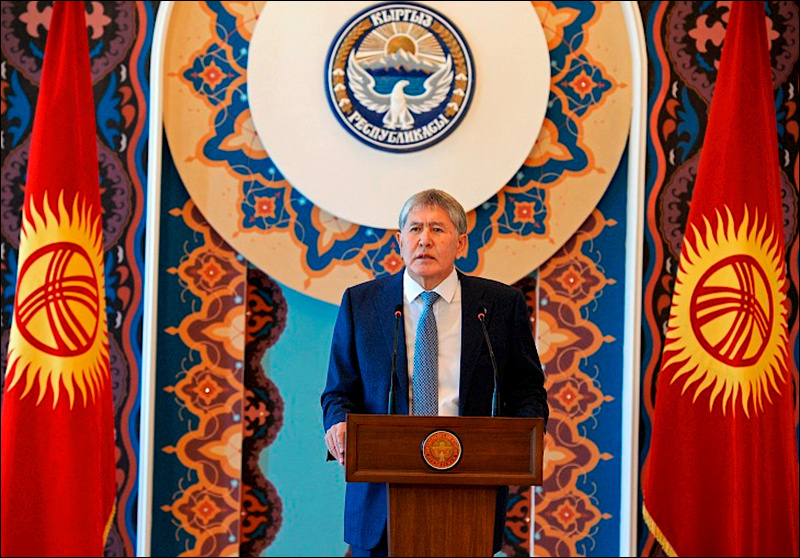 On 7 October, Almazbek Atambayev during his speech at the ceremony of presenting state awards accused the Kazakh authorities of "imposing their candidate" on the past presidential election in Kyrgyzstan. In response to these attacks, the Ministry of Foreign Affairs of Kazakhstan and the Prime Minister of this country Bakytzhan Sagintayev made statements in which they called Atambayev's statements "provocative" and "unacceptable." Then Kazakhstan refused to send its observers to elections in the neighbouring republic. The Ministry of Economy of Kyrgyzstan complained to the Eurasian Economic Commission (ECE) and the secretariat of the World Trade Organisation (WTO) about strengthening of control by Kazakhstan on the Kyrgyz-Kazakh border. On 18 October, prime ministers of Kazakhstan and Kyrgyzstan met and discussed the situation which resulted in Kazakhstan agreeing to allow individuals, passenger buses, cars and empty cargo trucks pass the border from Kyrgyzstan to Kazakhstan. At the same time, it is still unknown when cargo trucks loaded with Kyrgyz produced goods would be able to move on the territory of EEU via Kazakhstan in the future. After these negotiations, the conflict between the two countries reached a new level - Bishkek announced its intention to break the agreement with Kazakhstan, according to which Astana promised to transfer $ 100 million The assistance aims to improve the customs infrastructure of Kyrgyzstan and bring the veterinary and phytosanitary systems of the republic under the standards of the EEU (after repeated accusations that smuggling from China through the Kyrgyz border to the countries of the union). The bill, denunciating the agreement with Kazakhstan, passed the first reading in parliament. Kyrgyzstan officially joined the Eurasian Economic Union in May 2015. The agreement on the EEU provides the integration of the constituent countries of this union and assumes the guarantee of free movement of goods, services, capitals and labour in their territories, an agreed policy in the energy, industry, agriculture, transport. Russia, Belarus and Kazakhstan signed the first agreement on 29 May 2014 in Astana, and Armenia joined them on 2 January 2015. The document on accessing Kyrgyzstan to the agreement on the EEU signed on 23 December 2014. As part of the integration process, Russia allocated $ 1.2 billion for the implementation of the Roadmap for Kyrgyzstan, the parties set up a joint Development Fund, the finance of which were to be directed, in particular, to developing cooperation in the agro-industrial complex, the garment, textile, processing, mining and metallurgical industries; transport, housing, trade, business development and infrastructure.